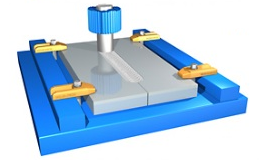 Friction Stir Welding (FSW), which was invented by Wayne Thomas at TWI in 1991, operates below the melting point of the work pieces to be joined. This leads to very high strength and minimal distortion. The process is consequently used in all areas of light-weight construction such as ship building, railway rolling stock, automotive and aerospace. We offer turn-key solutions for close-loop force controlled FSW machines in close co-operation with Stirtec. These can be used for FSW at up to 25 kN (2.5 t) and for high-speed machining at up to 15,000 rpm. The work pieces can be machined before and after welding in the same fixture using these hybrid machine tools. This achieves significant cost savings and very tight tolerances. Most metals can be friction stir welded, e.g. Friction stir welding of aluminium or copper is now state of the art, but even friction stir welding of steels achieves very promising results. Panels are assembled from aluminium extrusions in many industry sectors. Aluminium castings are increasingly used for making battery tubs for e-mobility. For FSW of dissimilar metals Special know-how is required regading tool design and set-up of the FSW machine.